We have published three versions of this map, showing how the area developed across the years. The map covers the area from Coppetts Road eastward to Prince's Avenue, and from Cromwell Road southward to Muswell Road. Part of Alexandra Park is in the SE corner, and the Palace is split by the sheetlines. Features include Bounds Green Pottery, St Saviour's church, railways (largely in tunnel), St Peter's Mission Church, St Peter-le-Poer church, Isolation Hospital, Colney Hatch Lane, etc. The 1911 version includes a list of Private Residents from an 1890 directory for Colney Hatch. The 1935 version includes a selection of Friern Barnet street directory entries. 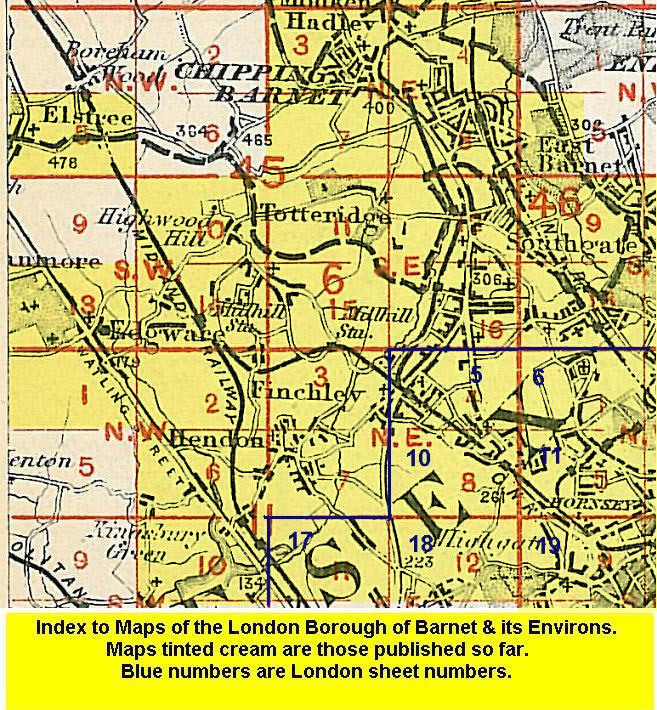 The map links up with Middlesex Sheet 7.13 Friern Barnet to the north; and with London Sheets 5 Finchley to the west, 7 Wood Green to the east, and 11 Muswell Hill to the south.